I can’t believe it’s only a few days now until I walk 26.2 miles across London for charity. All of the training that I have put in is going to be put to the test as not only do I have to battle sore feet and legs, there’s also the sleep deprivation as we’re walking at night. That alone is nothing compared to how many women have and are suffering with breast cancer in the UK. I think I can put my sore feet and tiredness aside. Part of the uniqueness of the Moon Walk is that walkers complete the course wearing their decorated bra. When you sign up for the Moon Walk, a bra is sent to you in the size of your choice to change into your choice of design. The more elaborate the better! The Moon Walk bra sent to me was white and I toyed with dyeing it pink to get a base colour, but after deliberation and attacks of body confidence, I decided to use one of my older pink bras as I felt it fitted slightly better. Walking as part of a small team, we had originally decided to decorate our bras similar to each other, however as time has gone on, we have just stuck to the same colour scheme of pink and mine has ended up very differently. I decided to have a look through Miss A’s craft stash before I started and I found scraps of sequins and fabric flowers, large sequins in great colours that my design sort of fell together without a lot of thought in the end. Don’t add anything on the straps or back that can rub or itch. You’re going to be attached to this bra for hours! Be careful not to sew anything through the whole bra cup as this will rub! Ouch! I didn’t mean to add as many sequins as I did, but they were easy enough to sew on and I was careful not to have the top layer overhanging to cause me any discomfort. I am pleased with my flower themed pink bra, and looking forward to the event itself now on Saturday. 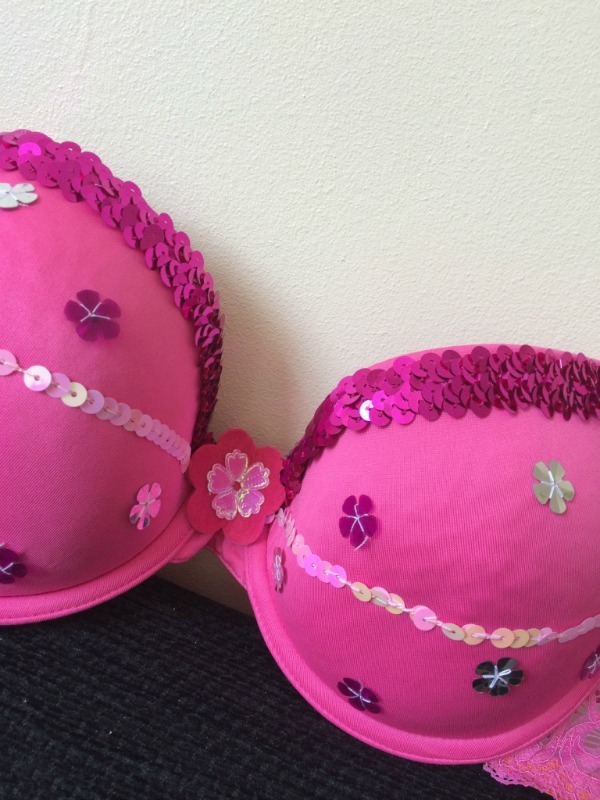 How would you decorate your Moon Walk bra? Good luck with your walk, I have a friend who goes most years and says its amazing, I don’t think I would be happy to go out in just my bra, but a very worthwhile cause. I have a zip up hoodie as well that I can do up if I need to. But I think on the night I won’t mind so much. Your decorated bra looks fab!! Hope the walk went well – all worth it for a good cause!